The pattern on the commutator resembles the ridges on the brushes. Once the brushes have no ridges visible either end then the car can be driven. Until then there will be too much current (if you drive it) going through a small percentage of the brush surfaces which will cause excessive wear to the brushes. There is an enormous difference in current from no load as you are doing now to when you are driving the car. When the brushes are ready the commutator will show an even patina (dark brown)surface right across. Last edited by evric on Sun, 09 Apr 2017, 04:39, edited 1 time in total. evric wrote: When the brushes are ready the commutator will show an even patina (dark brown)surface right across. As predicted, the darker patches are spreading. This is after about 17 hours at 3000 rpm. Fuel gauge shows about 1/4 charge remaining (of my 20kWh battery). Motor is just warmer than my hand. I can still see ridges on the trailing edge of the brush I can see. Here we are at hour 33. I've been running at 3000rpm+ (was 4500 for a few hours). Not sure how this compares to your 270 hours Eric? I think you were running yours a bit slower. The patina is spreading nicely. Still a couple of lighter colour lines. I got up enough courage to remove a pair of brushes. I'm reticent to do this because I damaged some of the original brushes removing them - and it is quite fiddly. Getting there, if they were all like this I might dare to start driving it. We really need to go to the tip! When installed, I can see those ridges on the trailing edge of the brushes. So one of these has ridges all the way along, and the other has almost no ridges visible. Inspecting the trailing edges of the other three sets of brushes, I think these two brushes (the two I removed) are probably the second-best set. One of the other sets has no ridges visible, the other two have more visible. Interestingly, the brush towards the front of the car always has more ridges. Something else I've noticed is that the rotor moves a little bit while running at speed. So while turning furiously, it wobbles a bit forwards and back. It moves perhaps 1/2 mm every few seconds. It will be "still" for a bit, then shifts to a new position. I don't see any particular pattern to it. Keep it going.. and remember to put the brushes back in the same position and orientation that they were in. When you say the rotor is moving - wouldn't that mean the bearings are loose? Last edited by evric on Fri, 14 Apr 2017, 05:47, edited 1 time in total. evric wrote: When you say the rotor is moving - wouldn't that mean the bearings are loose? Don't know if it is a problem or not. I do remember that when I installed the motor I noticed the shaft (and presumably the rotor) could move a couple of centimetres forward and back. Centimetres is a lot... millimetres would be understandable. I don't remember too much about it but sometimes motors have shims or washers which adjust end play when being assembled. Motor casings being put back together with a really thick gasket compared to standard so that the casing is longer than it should be. Bearings being on in reverse so that if it is offset, you get play. Are the bearings pressed on? If they are, then the shaft may be sliding inside the bearing. Casing wear where the bearing sits. If you have or do identify the motor and know what it is out of, maybe someone here works on them and can say what is usual endplay. Maybe checking out maintenance info for the motor online might identify the specifications and then the adjustment. My ideas. Right, I've found out a bit more about commutator stones. Looks like there are a couple of different sorts. There is a grinding stone that will grind down the commutator slightly. You use this one by taking out a brush and inserting the stone. Turn the motor slowly by some other means while holding the stone on the commutator in the place of the brush. This is not the sort of stone I was given. The other type is designed to be used while the brushes are in place and the motor is turning at speed under its own power. This is the sort I have. You push it onto the commutator and it crumbles into a fine powder. This action polishes the commutator, and the powder travels under the brushes to help wear them down quickly. The local motor guy said to use it in front of a brush that needs attention. He said if one was sparking then you use the stone in front of it until the sparking reduces down to nothing. I've only just figured this out. This is why the local guy thought that bedding in would take a matter of minutes, but Eric was saying 200+ hours for his. I was assuming that Eric was being too thorough and the local guy was being not thorough enough. In reality it seems like they were both being thorough, but with different tools. The comm stone can make the bedding-in process much quicker. He only gave me a little bit of comm stone, and I've used it all up now, so all a bit academic. Also, there are only really two brushes that I can access while running, so I guess that using the comm stone would preferentially wear down two of the brushes. Not sure how much of the grit would travel for more than one revolution. I've just gone out to inspect my old Kostov motor - the one in the shed that I burnt out last year. I can't see any play in the rotor of that one. This fits with my memory, when I bought the new one and installed it I noticed that the shaft could move a lot, and I wasn't used to that. 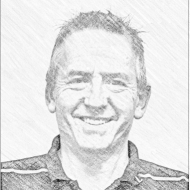 I hope you don't mind but I've copied one of your pictures so I could draw on it to highlight my thoughts. I've circled in yellow the commutator where it shows new wear from your running in process. 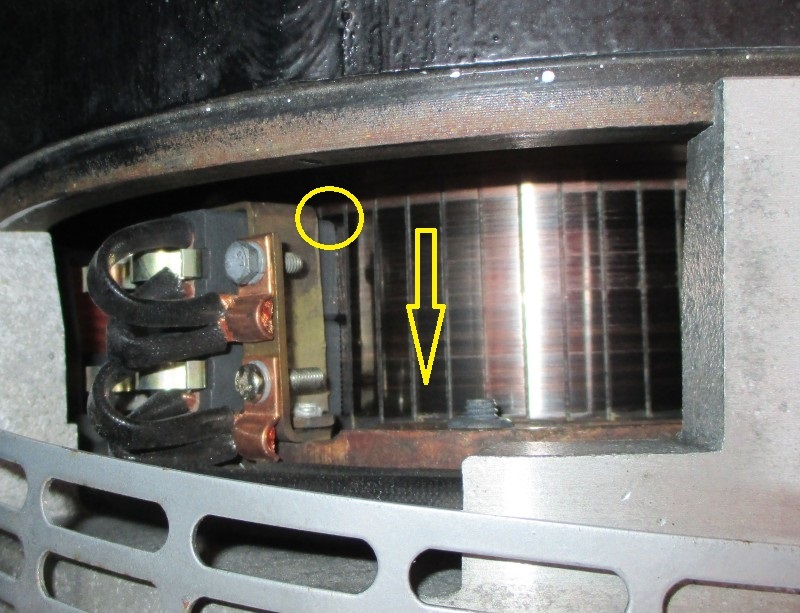 The browning of the commutator in this area is not from the brush pictured, so it means that either another brush is positioned further inwards (towards top of the picture) or your commutator is walking outwards (as per the yellow arrow I added). As you've stated that your shaft has centimeters of movement I would be concerned that the commutator is striking the top side of the brush holders. Did you check this for strike marks when you were replacing the brushes? If not, that's something I would be doing in case your failure wasn't brush related, but rather commutator float related. TooQik wrote: I hope you don't mind but I've copied one of your pictures so I could draw on it to highlight my thoughts. Not worn at all that I can tell even after 20,000km, just a browny colour. Smooth to the touch over the different colours along the bars. The commutator at the bottom of this photo is a bit shinier than the rest of it as I used up the last of my comm stone on it this morning. The brush has a chamfered corner. The actual 'top' of the brush lines up pretty close with the browning on the commutator. Maybe 1/2mm more brown than brush. Are you saying to look for the commutator hitting the brush holder near your yellow circle? You can see from the new photo that there is a long way to go before that happened. The commutator is about 50mm wide, so that distance is about 10mm. The movement I'm seeing while running in would be 1mm tops. Probably less. The cm movement I reported was before I installed the motor. The motor is now bolted to a flywheel, stuck to a clutch etc., back into the gearbox. Would be interesting to see if it moves when I push in the clutch. The brush holders don't seem to have any strike marks. They were not in the best shape when I removed the old brushes though. Some of the brushes were impossible to remove without breaking them, as the brush holders seemed to be a bit squashed. The brushes had worn a bit concave along their flat sides, then flared out to their original sizes where they poked out the bottom. When I went to install the new brushes some of the holders had to be bent back into shape before they would go in. The holders seem to be made of brass, and are fairly soft. They bent enough with a pair of pliers. Are you saying to look for the commutator hitting the brush holder near your yellow circle? I was yes, but if you didn't find any unusual marks on the brush holders then it's possibly not an issue, although you did mention the brush holders seemed a bit squashed...is this normal? The cautious part of me says you should double check for movement while depressing and releasing the clutch as this should show you how much float you have in your commutator. That would be 6000km of driving in 4th gear! I think this is good enough to put it back on the road. I've seen two sources say they should be 90%, and I reckon these are better than that. I've checked the play when pressing the clutch. There is movement. When the clutch is pressed the rotor moves a couple of mm. It stays in that position when the clutch is released. If I rev it up then after a few seconds it returns to its original position. Very difficult to take photos of. It moves in the 'right' direction, meaning that the brushes sit on a different part of the commutator, they don't run into the side or anything. I love to float a few ideas on this. So I'd guess that these electric motors usually attach to shafts that are immobile so that they only have to turn and not take end pressure. Which means that they have end play because it doesn't matter and that they'd usually be installed around the half-end-play position, ie in the middle. And that they are not designed to operate in an environment where end pressure is applied. So that eventually, you'd get a slope in the commutator from where the shaft likes to rotate to where it is forced to with the clutch in. So something to think about for the future. maybe. Edited so that it is newer and better, ie an upgrade. Last edited by bladecar on Mon, 17 Apr 2017, 09:52, edited 1 time in total. bladecar wrote: So I'd guess that these electric motors usually attach to shafts that are immobile so that they only have to turn and not take end pressure. As far as I know this motor is designed specifically for EV conversions. bladecar wrote: So that eventually, you'd get a slope in the commutator from where the shaft likes to rotate to where it is forced to with the clutch in. This does sound likely, doesn't it? Although with no wear at 20,000km I don't know if it would ever wear that much. I suppose the motor may go through several cars during its life. 4Springs wrote: "As far as I know this motor is designed specifically for EV conversions." Yes, so, I wonder, was it? I also wonder is there a general philosophy existing on whether an ev conversion would be expected to include a clutch. Last edited by bladecar on Wed, 19 Apr 2017, 10:16, edited 1 time in total. "End play" or bearing thrust management is quite a specific area of concern in industrial equipment design. It would be interesting to know if any of the DC motor manufacturing folk had clutch pressure in mind for EVs.